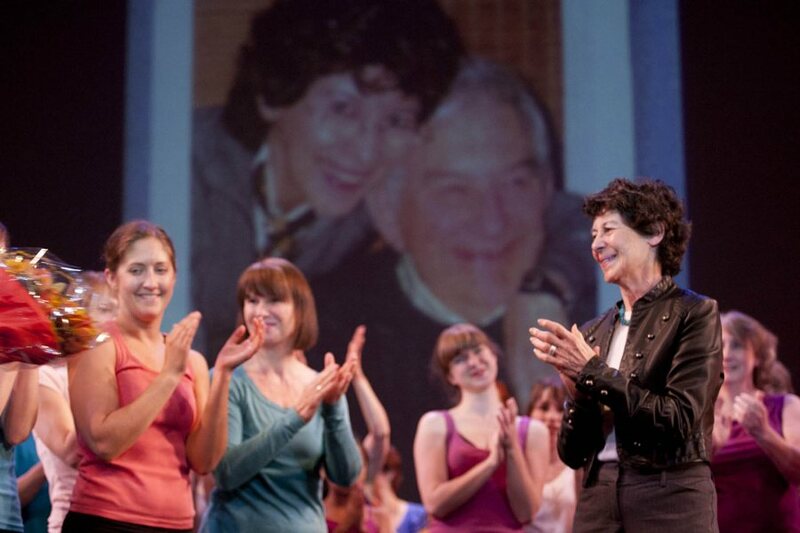 With an image of Marcy and the late Leonard Plavin in the background, retired Bates dance director Marcy Plavin applauds dancers during the April 30, 2011, dance alumni reunion. (Photographs by Phyllis Graber Jensen/Bates College). The shout-out to Marcy Plavin kicked off an April 30 evening of dance honoring the retired Bates dance director and her husband, the late Leonard Plavin, a photographer who compiled an invaluable visual archive depicting 40 years of dance at the college. 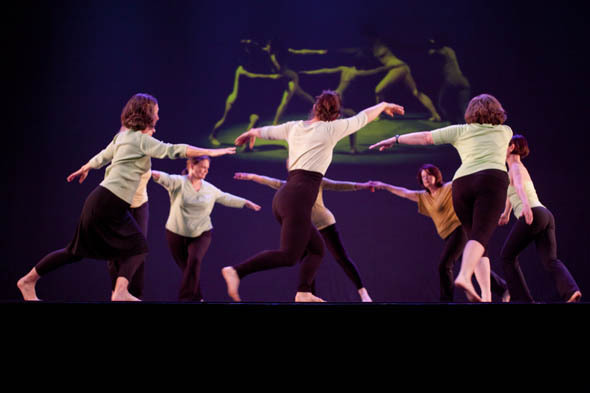 Held in a Schaeffer Theatre packed with alumni, staff, faculty and friends, the concert was a choreographic banquet. Nearly three hours long, it comprised 17 dances, two works combining dance and video, and an astounding acrobatic piece by Andrew Adams ’99. The program concluded with a moving tribute to Leonard. 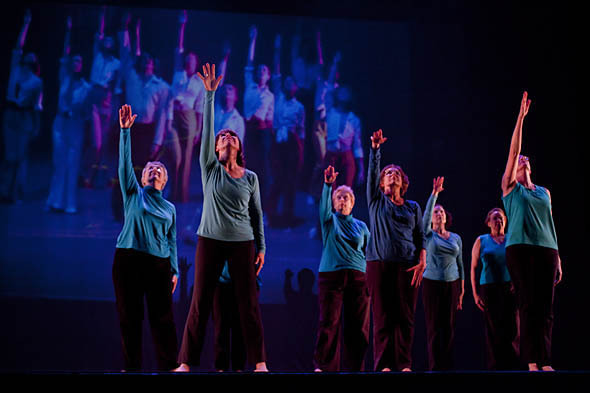 Choreographed around dozens of his images, the piece “A Moment in Focus” brought to the Schaeffer stage some 80 MDC veterans from as far back as the class of ’70. Short works made up most of the program. Choreographers included current dance program director Carol Dilley, with two works set to compositions by Alice Swanson Esty Professor of Music William Matthews; and Michael Foley ’89, associate professor of dance at the University of South Florida, who danced his own “Removing the Change” with Lynda Plavin Fitzgerald ’79, daughter of Marcy and Leonard. Fisher Qua ’06 and Meredith Sallee Qua ’07 reprise “Crazy,” the Modern Dance Company piece in which, as Bates students, they first danced together. • “Crazy,” choreographed by Sarahbelle Marsh ’05 to the Patsy Cline hit. In a great Bates love story, Fisher Qua ’06 and Meredith Sallee Qua ’07 first danced together when they did this piece back in the day, sparking a romance that led to marriage. With memorable skill and intimacy, the pair portrayed Marsh’s lovers at odds. • “Amazing Grace,” a buoyant, pastel-hued dance for five by Kim Kavazanjian ’04 that seemed to pay humorous tribute to Matisse’s “La Dance,” set to music by Mahalia Jackson and Flecktone bassist Victor Wooten. • “Homebound,” choreographed and performed by Liliana Amador-Marty ’91 and Alison Oakes Charbonnier ’92, who have worked together in dance since Bates. Using straight chairs as symbols of confinement, this succeeded brilliantly as both dance and psychological portrait. 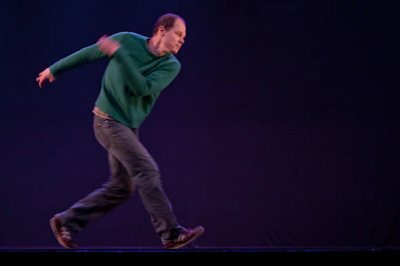 • “We’re Back!” Fitzgerald set this choreographic pun on the current Modern Dance Company, whose members spent much of the piece showing the audience their dorsal sides. Energetic, virtuosic and funny as heck, the moves peaked with three men somehow flinging themselves together to form a caterpillar doing pushups. • Evocative music performed live for two dances, “Santo” and “Catching up in Five Minutes,” by guitarist-composer George MacDonald ’10. • Three women from the ’70s and one from the ’80s formed a foursome for “Fore!” Choreographer Mary Griffin ’73 was one of the dancers depicting a golf game set to Ray Charles’ “Georgia” — perhaps a comment on the men-only membership policy of the Augusta National Golf Club. • And then there was Andrew Adams ’99, a professional strap artist, with the jaw-dropping “Out From Under.” Suspended on two straps hanging from the fly loft, the gravity-defying Adams twirled, struck impossible poses, juggled an umbrella and winched himself high above the stage by vertically rotating his body to wind the straps around his arms. Conceived by Dervilla McCann ’77, “A Moment in Focus: Dance Images by Leonard Plavin” was a tour de force. Groups of dancers, spanning three or four class years, interacted with projected Plavin images — mirroring the poses of the pictured dancers and tying the tableaux together with moves in diverse styles. The music too paid homage to Leonard, consisting of jazz favorites from his collection. One recurring photo, of massed dancers holding their faces and hands high, carried the transitions from one group of dancers to the next. It also afforded choreographic unity, helpful in a freewheeling mélange of styles that went from the Charleston to 1940s Broadway to dancers lying on the floor wiggling their feet to the strains of “Popsicle Toes,” sung by Diana Krall. The quality of the dancing was a tribute to the dedication and skill of these alumni, including nationally known choreographer John Carrafa ’76 — who not only helped pulled “Moment” together during that long Saturday afternoon, but caricatured himself during its performance.